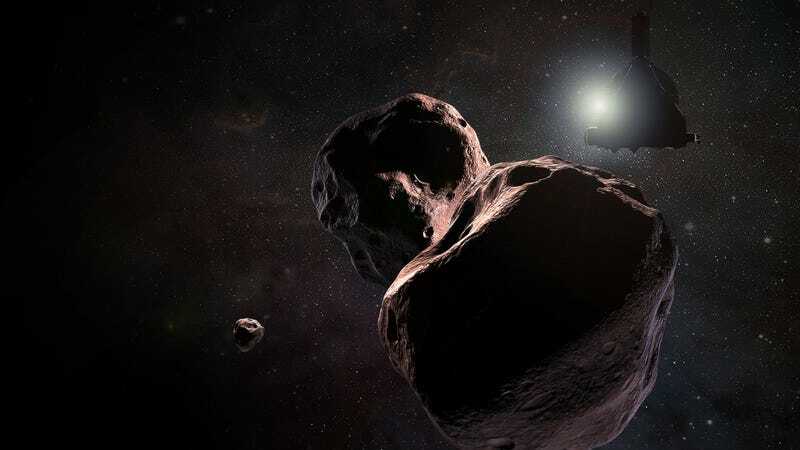 An artist’s impression of New Horizons flying past Ultima Thule. Pluto’s most famous visitor, the New Horizons spacecraft, has woken up after 165 days of hibernation. The probe is traveling onward to its next target, another mysterious Kuiper Belt object hiding in the far depths of the Solar System. Its nickname is Ultima Thule, though I prefer the much nicer MU69. New Horizons went into hibernation back in December 2017. This is a partial shutdown, where an onboard computer monitors the probe’s health and sends occasional status updates to Earth. The New Horizons team planned their close approach to Ultima Thule during this time. The probe is now awake and fully functional, according to a release from the Johns Hopkins University Applied Physics Laboratory. The team will update the spacecraft’s memory, further check the instruments, and plot the craft’s course. It will begin observing Ultima Thule in August, and its closest approach is scheduled for January 1, 2019. At first description, the new target it doesn’t sound so remarkable. It is either one or two hunks of ice and rock, perhaps 20 miles in diameter total. But it’s actually pretty incredible: As Emily Lakdawalla and Casey Dreier explained for the Planetary Society, the New Horizons team didn’t have a proposed target beyond Pluto when they launched from Earth, and were having trouble finding one with ground-based satellites. But they lucked out when the Hubble Space Telescope found MU69 in June, 2014. Ultima Thule resides 1 billion miles (1.6 billion kilometers) beyond Pluto, and will be the furthest object ever explored by NASA, reports Space.com. Pluto itself is already around 3 billion miles from Earth. New Horizons will hopefully capture high-resolution images of the object and potentially help scientists figure out what it’s made of. The end goal is to learn more about the Kuiper Belt—a strange, icy place where enormous rocks, some bigger than the largest asteroids, orbit a distant Sun.